There are admirable individuals and organizations that the general public hardly hears about, who try to lessen the human suffering at the border, offering relief and resources. Their charity seems to be viewed by the general public as controversial. Their actions are not often covered by the national media. It is hard to believe that these individuals and organizations are frequently harassed by both anti-immigrant groups and government agencies. These charities constantly put their life and property at risk, and avoid the spotlight. I’ll share with the reader some names I am aware of. I am sure this is the tip of the iceberg! Please visit this page occasionally, for I will continue expanding and updating it. Tucson’s NO MORE DEATHS was founded in 2004 by religious leaders, seeking to provide aid to migrants and slow down their increasing death rate. The group trains and sets up volunteers to patrol the Arizona Sonora desert, by car and by foot. They also work across the border, in Nogales, Mexico, helping those that have been returned to Mexico, repatriated individuals who arrive without means, money and often in poor health. In addition to attending to immediate needs, these volunteers also record and document human right abuses on both sides of the border. These volunteers face harsh working conditions, more than expected. They also face harassment from what should be unlikely sources. In one such episode, in 2005 two No More Deaths volunteers were arrested by the Border Patrol and charged with smuggling, for transporting three immigrants to Tucson to obtain medical attention. Their defense won this case after years of appeal, and the defendants were later recognized with the Óscar Romero Award for Human Rights for their work. 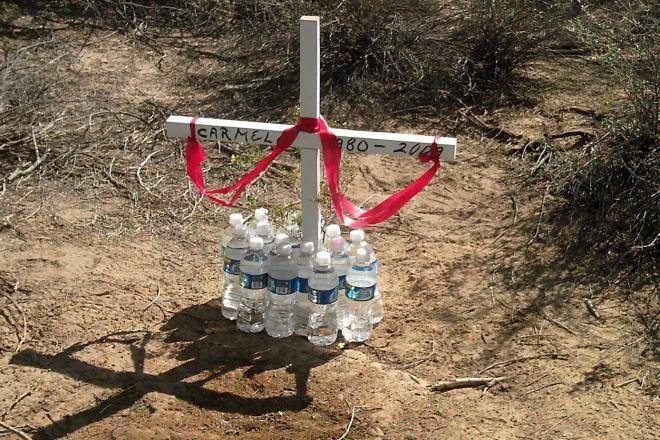 In another incident, in 2008 a volunteer was charged with littering for leaving water bottles for immigrants crossing the desert. This case was also overturned on appeal in 2010. You can see clearly that the enforcement agencies do not encourage charity work at the border. As part of their human rights reporting, No More Deaths released a report detailing U.S. Border Patrol abuse of migrants apprehended on the US – Mexico border. Visit their page www.nomoredeaths.org and view or download this report for free. A search and rescue group, LOS ANGELES DEL DESIERTO (Desert Angels), was founded by Rafael Hernandez, a Mexican-American, after an incident over 15 years ago. An immigrant himself, he was a firefighter in Mexico who had conducted extensive search-and rescue missions. When Mr.Hernandez saw a TV report on a missing man in the mountains east of San Diego County, he went there figuring to help. To his surprise, he found that no one looks for lost immigrants at the time, even if their American relatives appeal for help on TV. So he recruited a few people familiar with the area, and indeed found the missing man. And thankfully, he has not stopped helping lost people since, either. Unfortunately, he can only help an average of two callers out of ten calls. That is mostly because callers must provide some location information to start a search, and callers mostly lack this information. This group survives on donations, and does not charge for searches. Hernandez warns that the desert areas south of the border are now patrolled by gunmen working for drug cartels. The drug smuggling business appears to have expanded into human smuggling, a lucrative field that brings between $3000 to $5000 per head, according to Hernandez. This new development means that Hernandez work is further complicated by dangerous cartel encounters, while also facing diminishing US agencies’ cooperation. To learn more about the Desert Angels, visit their website www.losangelesdeldesierto.org. Other groups addressing border issues include Coalición de Derechos Humanos/Alianza Indígena Sin Fronteras, Samaritans, Humane Borders, ACLU… I’ll write about these in future blogs.